For processes that are sensitive to humidity, even small relative humidity (RH) changes can dramatically affect product production, storage and shipping – impacting everything from production time to product quality to cost. To achieve optimal conditions, you need precise humidity data. With the DataTrace® Micropack III (MPIII) Humidity Data Logger, you get it. The highly accurate MPIII Relative Humidity Data Logger monitors RH across the full range, from 0% to 100% at temperatures from 0°C (32°F) to 85°C (185°F). 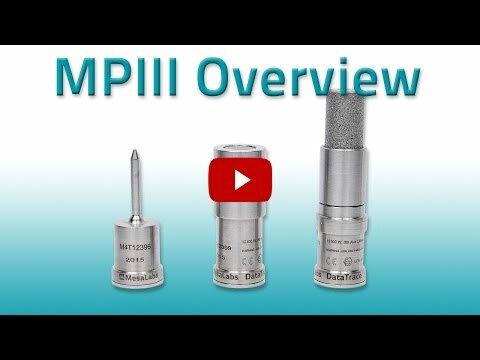 The MPIII Relative Humidity Data Logger provides accurate data to help you optimize food, pharmaceutical and other manufacturing processes. The closer the sensor is to the product, the more valuable the collected data. That’s one reason the MPIII Relative Humidity Data Logger is so small. Rather than mounting externally like most sensors, our wireless data logger easily fits inside a variety of packages, like an ethylene oxide ER pack during sterilization, to maximize accuracy and process validation. And since it is wireless and operates at low voltage, it is intrinsically safe for hazardous environments. Part of DataTrace®‘s comprehensive solution, the wireless Micropack III Relative Humidity Data Logger requires minimal training to use. Features like IR communication and batch programming and reading makes data collection fast and simple. MPIII is a single, integrated solution which can be extended to simplify data logging of an array of process parameters. At the heart of the solution is DataTrace®‘s intuitive and highly secure FDA 21CFR Part 11 compliant DataTrace Pro software. You can’t beat it for flexibility and ease of use. Create reports in any format you want. Save time and money with automatic downloads and graphs. Use password protected access, electronic signatures and automatic documentation for audit trails to streamline your work. Even synchronize multiple Loggers (in any combination of Logger types) to the same program. When the pressure is on, this is the system you need. The Micropack III Relative Humidity Data Logger’s small design and intuitive, easy-to-use software makes it easy to integrate into your process greatly improving your productivity. No humidity monitoring system gives you more flexibility.